To be successful with a website, you need to define the goals you want it to achieve. 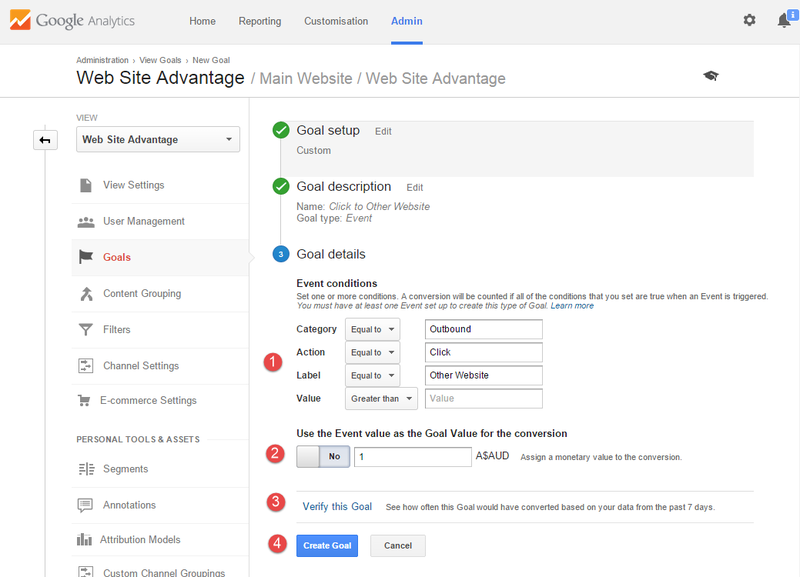 Common website goals are receiving a contact email or a cart submission. Being able to track those goal and analyse what causes them to happen can be a great weapon to help you optimise your website design, online advertising and promotional activities. Working on increasing the rate you achieve goals (conversion optimisation) will focus you on activities that most benefit your business. 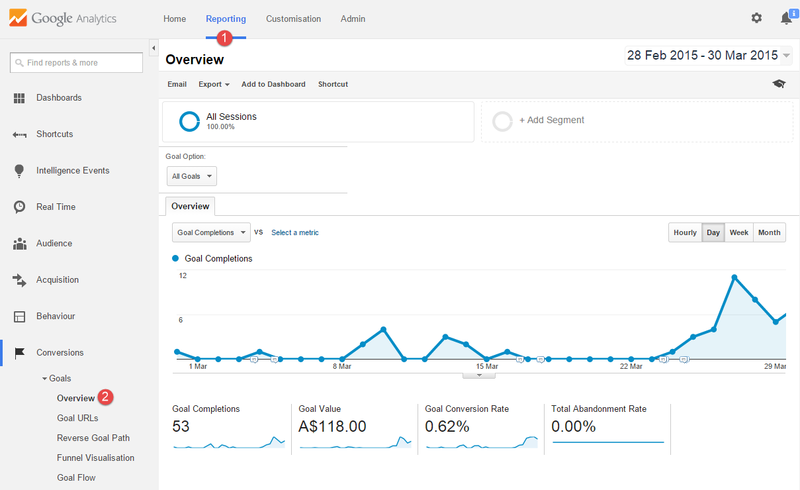 To help you do that, Google Analytics allows you to setup Goals and analyse tracking data in relation to what helps you get to those goals. Which websites send you visitors that trigger goals; Which pages work well at getting them to your goals; Which adverts are successful, and which are a waste of your money. The simplest and most common way to define a goal is through the viewing of a certain page. If a visitor reaches that page, then a goal is achieved. For example, say you have a contact page that goes to a thankyou page on submission. Then a visit to the thankyou page can be a goal. For eCommerce websites another logical goal is the final order completion page. Think about the objectives of your website and what you want people to do. Can you tack that by a visit to a specific page? Some websites may feel it is a success if a person (user) stays on the website for a specific amount of time or they visit a certain number of pages. Or maybe there is not enough alternate goal data to get an idea of how well the website is performing. Then considering active users as a success can help you determine what works. As you determine goals you will realise each has a different value. If you are lucky you can place a true dollar value on a goal based on the average life time profit you make from a person reaching a goal. In most cases you will probably have to guesstimate a value. As long as your individual goal estimates are good in relation to each other you will be ok. e.g. You may value a subscription at $1 while a contact is worth $5. Someone who is active may be worth 50c while an order request could be worth $50 on average. Select the Admin tab then choose the Account, Property and View you wish to add the goals to. Most businesses will just have one of each so these should be already correct. 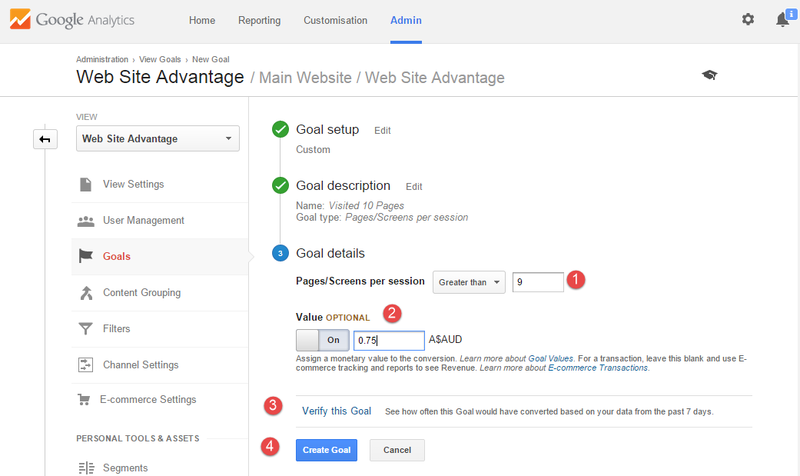 Then click on the Goals option in the Views section. You should now see a list of goals (which may be empty). 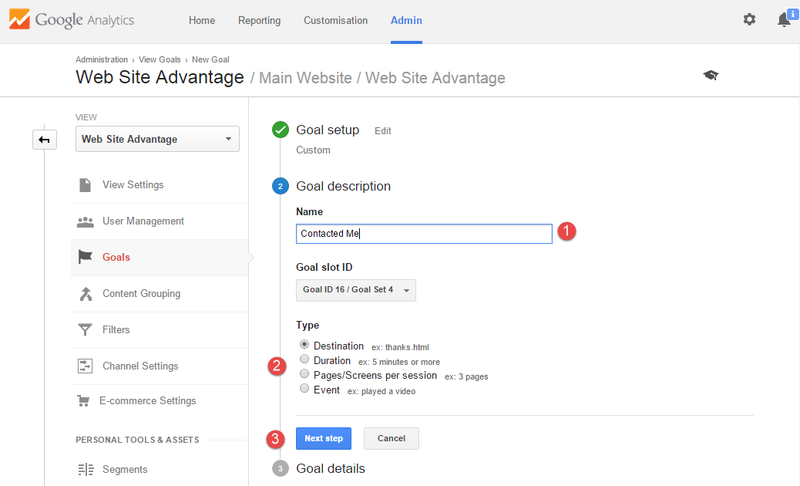 Give your goal a name and select how the goal will be triggered. Destination - If the goal is achieved by a page being visited. Duration - If the goal is achieved by a person staying on the site for a specific time. Pages/Screens per session - If the goal is achieved by a person visiting so many pages. Event - If the goal is achieved by a custom added event (See later). Then your onto the Next Step. The key part here is that you get the Destination correct. You only should enter the path of the page that you have designated as the destination. This means the domain should be excluded and it should start with a slash (/). If you sometimes add different parameters to the destination than change the match type to Begins with and just enter the part which is consistent. 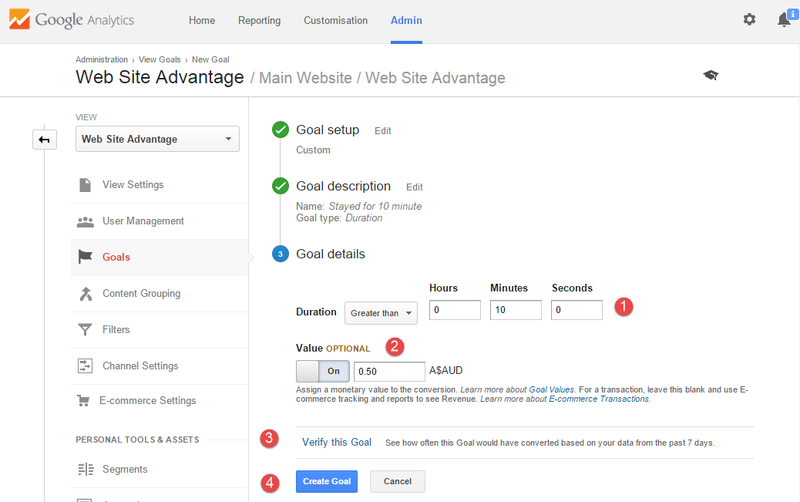 Then you can optionally add a Value to the Goal. 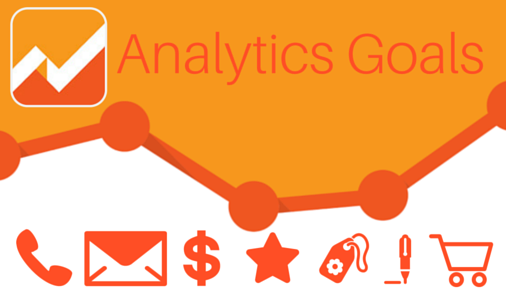 Do so if you can as it helps Analytics put a value to pages on your website. The funnel option is rarely used and is for cases where achieving a goal takes several steps. e.g. for tracking users through a checkout process. You can then click Verify this Goal which will see if it would have been triggered in the past week. If so, you know you are good to go. Click Create Goal and your done. This should be self explanatory. Enter a duration you think means a visitor was showing good interest in the website. Then optionally put a money value to it. If you verify the goal you will see a percentage of visitors that stay that long. You could use this to refine the duration value you wish to consider as success. You could also add multiple goals with longer durations and higher values. For this one note that the value is Greater Than. So if you want to have 10 pages as your trigger then enter 9. Sometimes there is no landing page to trigger a goal. Maybe a form submit stays on the same page. Or a goal is to get someone to click to another website. Or the goal is to get someone to click on a phone number or email address to contact you. These sorts of goals may be trackable via events. The three parameters in the event function call are the Category, Action and Label. To turn these events into goals you will need to match them up with an event goals setting. You don't have to fill in all the conditions, just fill in enough to ensure only the events you want trigger the goal. e.g You may want a Click to a Social Page as a goal which covers events from all the social pages you have. Maybe have all Social related events use a Social Category to make it easy to see them as one. Events can specify their own value via an extra value in the function call, or you can enter it in via the goal settings. Goals information is dotted around many of the reports. 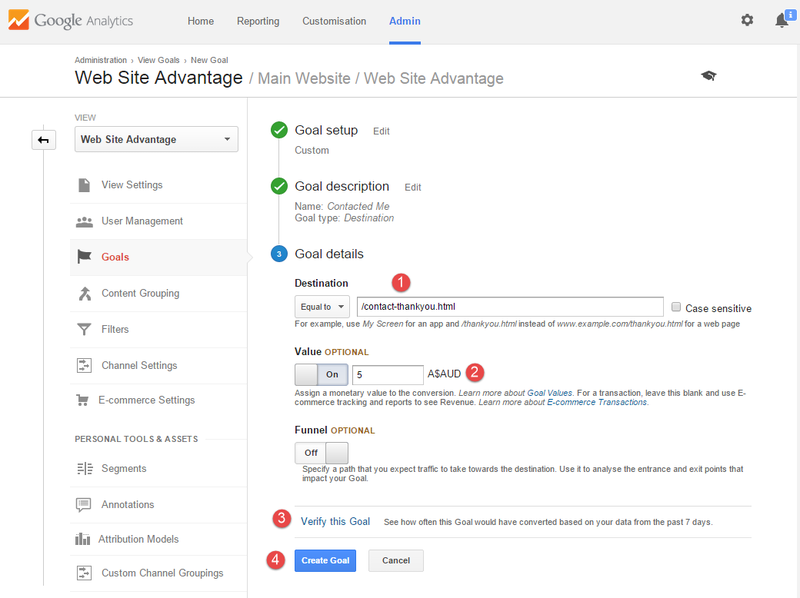 And your Goal Values will get used to determine Page values in Behaviour->Site Content reports.